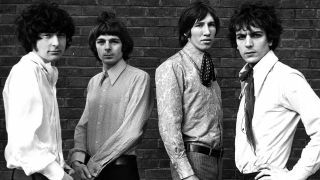 A black and white video for Pink Floyd’s first single Arnold Layne has been released. The footage was shot on the beach at East Wittering, West Sussex, England, in February 1967 and was directed by Derek Nice ahead of its launch in March of that year. Arnold Layne subsequently appeared on the Relics album in 1971, 1983’s Works and Echoes: The Best Of Pink Floyd, which arrived in 2001. It most recently featured in the The Early Years 1965 - 1972 box set, which was split into six individual volumes and released in March this year. The track is included on Cambridge St/Ation (1965-1967), with Germin/Ation (1968), Dramatis/Ation (1969), Devi/Ation (1970), Reverber/Ation (1971) and Obfusc/Ation (1972) completing the collection. In July, a video for Floyd’s 1967 track Apples And Oranges, which was filmed in a Belgian fruit market, was released.